Does your mouth water when you think of fresh basil pesto? Oh, mine does. I love summer for all the fresh fruits and vegetables, but mostly for the fresh basil in my garden and the reasonably priced large packages of basil at the market. 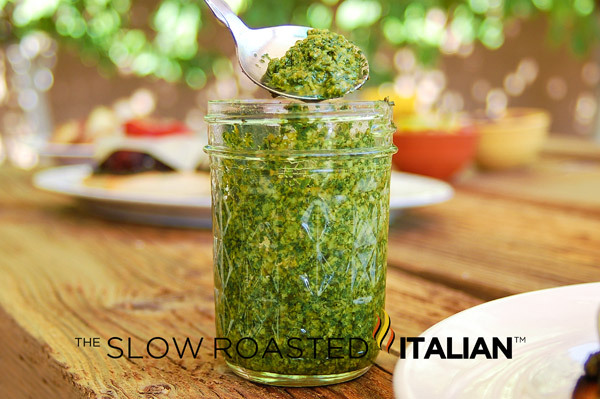 Hi Slow Roasters, thank you for joining us to celebrate the 1 year anniversary of The Slow Roasted Italian during TSRI's Summer Grilling Celebration. We shared an amazingly delicious Tuscan Summer Sun-dried Tomato Burger with you that had an fantastically flavorful and bright pesto on the toasted ciabatta bun. This Simply Delicious Classic Fresh Basil Pesto was amazing using Bella Sun Luci's Extra Virgin Olive Oil. A fruity and fragrant olive oil that is a treat to the palate, combined with the rich and spicy, slightly peppery flavor of the fresh basil, it is a perfect match. A Tuscan Summer Sun-dried Tomato Burger served over a bed of Simply Delicious Classic Fresh Basil Pesto would then be a match made in heaven. This pesto is wonderfully aromatic and scrumptious with the fresh flavors of basil, toasted pignolis, garlic, olive oil and a hint of Parmigiano-Reggiano. Whether it is poured over a bowl of fresh pasta, spread on bruschetta, or served with your favorite burger, you are going to LOVE LOVE LOVE this pesto! Don't forget about our amazing giveaway this week, sponsored by Mooney Farms Bella Sun Luci fabulous line of sun-dried tomatoes (and this wonderful olive oil). Today we are adding a bonus entry. Earn this bonus entry by LIKING Mooney Farms on Facebook. Click here for more details. BE SURE TO CHECK BACK TOMORROW. When you can earn 2 BONUS entries!!! Combine all ingredients (except olive oil) in the bowl of a food processor. Pulse until it forms a smooth paste. Scrape down the bowl (if necessary) and through the pour spout with the processor running, slowly add the olive oil. Pour into an airtight container and refrigerate until needed or serve immediately. The color here is gorgeous. Great photo! I have pesto on my list this week as well. The basil plants are in abundance! I have been known to make great big batches of pesto at the end of the growing season. Leave out the cheese and line a plastic ice tray with plastic wrap. Drop tablespoons of the prepared pesto into the ice cube tray and freeze. Pop them out once frozen and place in a sealable container until needed. Add freshly grated cheese when ready to use. Drop them in soup, pasta, whatever! Yummmmmy - guess I should have just blogged that one instead of taking up all this room! This is absolutely beautiful! I love to make a roasted veggie pressed sandwich with basil pesto.